1. (--) Em, the protagonist - Oh, man I disliked her. I was tempted to stop reading because of her. She was selfish and made such stupid choices. And honestly? I can't even say much about her personality because I couldn't really find a reason to like her. At first she's annoyed with her best friend--though there's very little reason, from what I could tell; yeah, Gabby stopped paying as much attention as before, but then at the end of their phone conversation (at the beginning of the book), she says she wants to sleep over at Em's... which makes Em's annoyance trivial in my opinion. And if Em goes on and on about how many things she and Gabby have done together and how they're such great best friends, why on earth is Em so unbelievably disloyal?! Besides all that, Em is also not assertive and bemoans her situation way too much for my liking. 2. (+) Side Characters - The side characters are not that well developed per say, but they get the job done. It felt like high school on repeat. I wasn't particularly attached to any of them either, but again, I thought that they, in combination with the descriptions of Ascension, really set the scene. Chase is somewhere between protagonist and side character, but I almost wish that he were the protagonist rather than Em. Even though he too does stupid stuff and I didn't quite like his character, I liked him more than Em. 3. (+/-) The Idea - Okay, the idea is kind of cool with karma and the Furies... but it went too far / was hard to believe. Yeah, all the kids did something stupid, but haven't we all done something we regret? And have we all paid such drastic prices for them? This scenario offers no chance for maturation and character growth and realization. 5. (+) The Writing - The writing was really fluid. It was a good balance of character thought/perspective and action, and it was easy to slip into what was happening to Em and Chase. Funny that Lauren Kate is an author who blurbed the book, because I'd actually say their third person perspective writing is pretty similar. 6. (+) Pacing - The best part of the story in my opinion. YA is filled with hits and misses in regards to pacing, but this one worked for me. I didn't put the book down because it flowed pretty well and the tension kept increasing. My only complaint would be the first two chapters--they were clogged down with backstory and had very little happen (both characters are getting ready for a party). 7. (+/-) The Villains - So you know who the villains are... and you have an inkling for what they could do based off the prologue... so you do feel they're dangerous... and yet I didn't feel as threatened by them as I thought I would. The explanation for why they do what they do was completely unsatisfying for me. And their names and appearances? Okay, maybe it was supposed to be one of those situations where you don't expect such cruelty from delicate? things, but when I read about the Furies, I already feel like something bad will happen so I don't need that whole "things are not what they seem" type. I want to know why. I want to really feel their power. And in both cases, the book was lackluster. 8. (--) The Action - There's plenty of action when the story gets going... but the things that actually happen seem so trivial! This is my complaint about the whole book---basically too much high school drama! Too much of the high school perspective. It was like a contemporary novel that decided it wanted to explain its students's misery with a paranormal element... but it didn't have the touching, emotional development of a contemporary and it lacked the magical or creepy edge that a paranormal would have. 9. (--) Unbelievable - I probably already wrote about how unbelievable parts of this story were... but it gets its own category because I think that one of the key aspects in writing a paranormal is making sure that it's believable... (or at least established well). And that didn't happen for me here. 10. 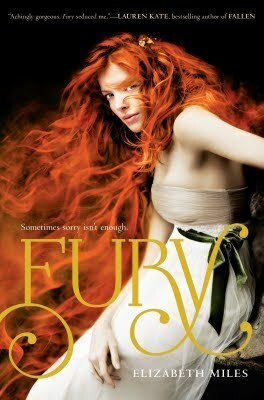 (+) The Cover - I like this cover a lot because the red hair is a really good image for fury. It also features arguably the most important character: Ty. Plus, it's just pretty. It doesn't tell you all that much about the book, but in combination with the summary, I feel like the cover provides good symbolism. Part of my criticism may stem from the fact that the BEA accounts I read all said that the excerpt Elizabeth Miles read from Fury made it sound awesome. I enjoyed it... but not as much as I had hoped I would. I disliked all the characters too, but I gave it points for being quite a cool storyline. Thanks for the review - I'm gonna read the sequel just to find out what happens next! I've heard mixed things about this one. Honest review. Thanks for sharing. Fury alternates between two teens, Emily and Chase, and carefully sketches in the details of their ordinary, every day lives. It is surprising to discover that the mythological beings are not the main characters of this novel -- instead, they hover on the fringe, leaving the focus on the remarkably human and flawed leads. Elizabeth Miles brings her cast to life, making them seem more like people than characters.